The truth about chocolate is tough to swallow. My heart aches for the two million children, mainly in West Africa, who work on cocoa plantations. Far too many of them toil under slave-like conditions, forced to handle dangerous chemicals, and swing machetes sharp enough to maim. Most are paid next to nothing. Some are abducted from their homes and forced to work for free without the opportunity to go to school, forfeiting dreams for the future. For me, Easter Sunday has always been a time of beauty, hope, and new beginnings. The sun is often shining, birds have returned from the south, and there's that happy smell of wet soil in the air. 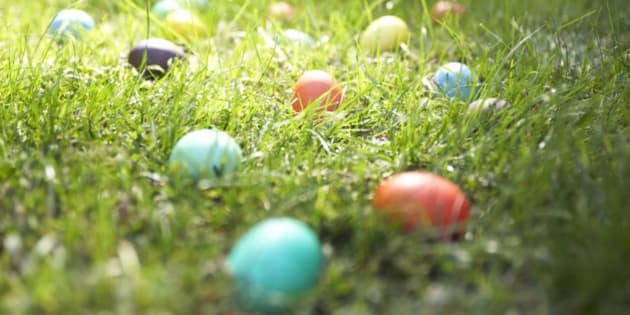 Perhaps best of all, my growing sons still love to run around the garden with their Easter baskets, shouting with delight when they spot a chocolate egg. Chocolate can be a wonderful part of Easter. So what's a parent to do when learning that most of it is produced on the backs of child workers? A recent poll for World Vision indicated that only four per cent of us most associate child labour with chocolate, as opposed to 61 per cent for clothing. 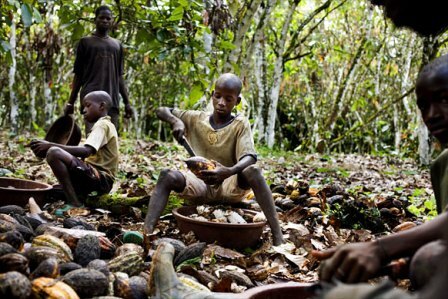 Many Canadians are surprised to learn that some 95 per cent of the world's chocolate is not certified to be free from child labour. It's enough to turn anyone with a beating heart off chocolate for good -- yet I can't stop yearning for those Easter eggs. It's not just because they're delicious. It's about believing that chocolate, this wonderful thing, can be good for all of us. I want parents in West Africa to be able to work on cocoa plantations under safe, decent conditions, to go home to their kids at a reasonable time, and be paid a fair wage for their labour. I want them to be able to send their kids to school each day, not into abusive working situations on the plantations. And I want those kids to be able to laugh and play as mine do. Changing our approach to chocolate is going to take time. It's hard to think about children we've never met when we're just desperate for that afternoon pick-me-up. And we've become accustomed to a vast selection of inexpensive chocolate at every checkout counter in the land, not to mention Easter goodies in the shapes of superheroes and Disney princesses. Sign a petition. World Vision Canada's online petition calls on Cadbury to bring its fair trade Easter egg--already available in Australia--to Canada. Buy Fair Trade. 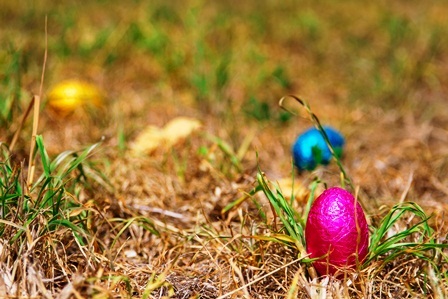 Many specialty shops sell Easter goodies made without child labour. Even buying just one or two things can be a good first step. Check World Vison's Good Chocolate Guide for other ethical options. Camino even has an ethical bunny this year! Help a child today. Keep a child in a cocoa-producing country like Ghana safe from labour starting now by sponsoring them on a monthly basis. You'll be helping their whole community to support its children, providing food, clean water, medical care and the chance to stay in school. Talk with your children. World Vision's online infographic is appropriate for older children or teens, and explains how child labour feeds chocolate production. Explain the difference between the fair trade bar you've bought this Easter, and some of the other chocolate. Stay involved. Your voice will be important as chocolate companies move toward going all fair-trade certified by 2020, as will your purchasing power. Stay tuned to World Vision's No Child For Sale site for the latest developments, including the new Responsible Chocolate Checklist. 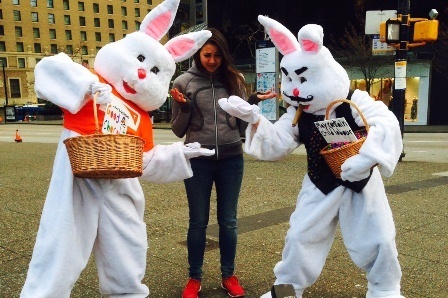 The Bitter Chocolate Bunny and the World Vision Bunny look to the streets of Toronto and Vancouver this week, with the latter offering samples of ethically certified chocolate and urging passersby to hop aboard the 2015 No Child for Sale campaign.